NYC & Company became a major blip on our radar when it locked in the first ever city-to-city partnership with Cape Town to boost tourism between the two iconic cities. 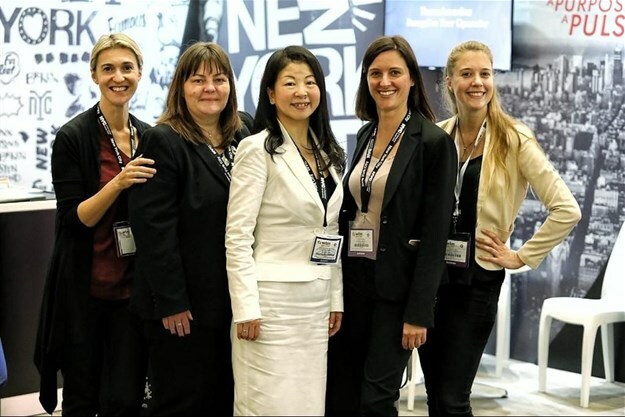 The destination marketing organisation set up shop at World Travel Market Africa 2018 where we caught up with Makiko Matsuda Healy, managing director of tourism market development, to find out what New York tourism is all about. Why participate in World Travel Market Africa? This is very much our introduction to the South African and African market. There have always been travellers from South Africa, but now we’re getting visitors from Ethiopia, Nigeria, Kenya, etc. Not to mention players from these regions as well as the Middle East like Emirates and Turkish Airlines, so the access is there. While it’s still, relatively speaking, a small volume, the sector is growing. What often happens with a new market is it grows fast. We want to be sure about what the motivation for travellers are, how the industry is captured, and who the players are. So, attending WTM Africa is also a learning process for us. What synergies exist between New York and the other major American destinations and cities like Cape Town and Johannesburg? The great thing about New York City is that we’re known for belonging to the world. No matter what happens with the government and politics, the city is always welcoming the world. In fact, after last year’s travel changes/restrictions, we were the first US destination to launch a campaign of New York City welcoming the world, which really celebrates diversity - that’s what New York City is all about, we don’t change our DNA. In terms of synergy with Cape Town and Johannesburg, in particular, it also celebrates diversity. Also, the street culture, new developments, old areas reinventing themselves, co-working spaces, different ideas from different people getting together and creating something new – that’s something we have in New York too. So there’s great synergy there, and not just with South African cities, but Africa in general. We met some African tour operators that remarked that they do need African food for clientele visiting the city, which is no problem at all in New York because we have so many cuisines from all over the world, including African cuisines. And it’s all really authentic as it serves the local community of that culture. We have South African restaurants like Aria Winebar in New York - restaurants like this are really part of the New York City culture which is again shared with other cultures. Spending the day relaxing, isn't that how all weekends should go? What is the image America has of South African travellers? Travellers from South Africa are fairly well travelled and they like everything paced well, they don’t want to jam everything in - which is quite an interesting contrast from travellers coming in from some of the other countries. While they are interested in the classic and iconic New York City attractions, they often go for the off-the-beaten-path and more experiential offerings – which is the global trend in terms of travel. What image of New York do you want to leave South Africa and Africa with at WTM Africa? Diversity of offerings. New York has anything and everything and it’s not just about the iconic experiences but all sorts of local and unique experiences. Also, brand new experiences for people who have already been to New York. We’re calling this ‘new New York’ because there are so many new things happening, new hotel developments across the city and large events. Lower Manhattan is being developed quite a bit. Visitors used to just pass through, but now it is becoming a destination within a destination with a number of museums, shopping opportunities, etc. Even mid-town which people think is so cliché… is really not, because there are so many new things including the National Geographic Encounter – under water, virtual reality experience. There are also a lot of family-oriented attractions like Gulliver’s Gate which is a miniatures world and SpyScape (the Spy Musem). Now, we’ll really be developing this working relationship with the travel community here and then have constant engagement and education, product development and PR, of course. We’ll really be working on increasing our presence here.